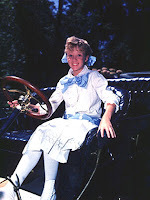 Raise your hand if you grew up thinking of Haley Mills as Pollyanna? I know in my world, Haley Mills was the ultimate "Glad Girl" who was charming and endearing. I was unaware of the fact that there were several movie adaptations of Pollyanna. The first was produced in 1920 and starred Mary Pickford. However, the Pollyanna that shall live in infamy (at least in my mind) will be Mills in Disney's 1960's adaptation of this well-loved children's classic. It had been a long time since I had seen the Disney movie of Pollyanna and I spent last week rewatching parts of it. I had forgotten a lot of the story line so I happily dived into the book. I found stark differences between the book and the movie. Frankly, I like Haley Mills better. (This might be a good argument for those who request that their children read books before seeing the movie adaptations.) 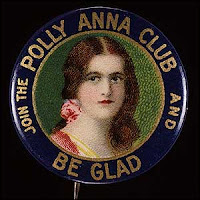 The Pollyanna in the book was a bit weepy, a bit clingy and a bit too much like Anne Shirley in her inability to stop talking. (I don't mind this personality quirk in Anne. I just mind it when other characters "steal" from Montgomery in shaping their own girl characters.) In the movie, Pollyanna seems to use her intuition when speaking to the other characters whereas in the book she just spouts off with whatever random thought runs through her head, leading to no end of mischief. The nice thing about the book is that there is greater detail surrounding Pollyanna's accident which causes her paralysis. In the book, we find conclusion in her healing. The movie implies that she'll get better, but doesn't explicitly say so. I thought both the movie and the book were about the same when it came to explaining Aunt Polly's feelings towards the young girl. I much preferred the movie version of Nancy, Aunt Polly's maid, to the book version. She's a bit more refined and genteel in the movie! So, there you have it! I should definitely read the books before I watch the movies, I know! I know! I love Haley Mills in Pollyanna. And don't forget The Parent Trap!! I read Pollyanna as a child but barely remember any of the story. I can't wait to read/watch these with my daughter. I loved Haley Mills! I haven't read the book. Thanks so much for reviewing it. What was the Haley Mills movie in which she became a nun? Haley Mills played a nun??? The Disney "Pollyanna" was a favorite at my house when my kids were young. It was only recently that I learned it was based on a book. So I bought it and it has been sitting faithfully on the shelf ever since. The movie everyone is referring to is The Trouble With Angels and Hayley Mills played a troubled young girl who goes to an all-girls school run by nuns.